I think it's going to be a near-total loss. I hope the bell-towers are saved as well as the front of the cathedral. Live video here. English language feed here. Note that they might stop reporting on this at any moment; it is live, as I said. Bright yellow flames are shooting out of the roof of the cathedral. I guess it's possible that it's just the scaffolding on the roof (part of a renovation of the cathedral's edifice) that's burning. But I don't know; my first thought was that these were flames shooting out from the inside of the church. The spire is toast. 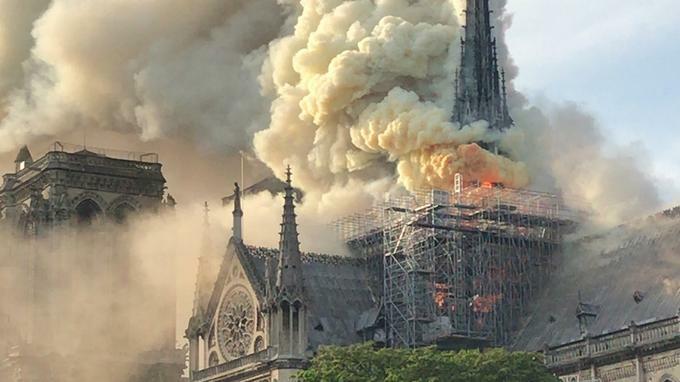 Orange flames are now quite high above the roof, almost at the level of those two bell towers at the front of the church. I'll find out what's happening. This is breaking news. There's no word on how the cathedral caught fire. They're releasing the Mueller report Thursday morning.